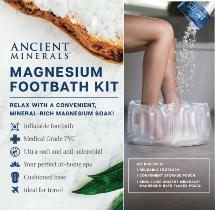 The Ancient Minerals Magnesium footbath kit is the most convenient magnesium bath application yet! It provides relaxation when you need it, and allows you to replicate the ancient practice of balneotherapy at home (or when traveling) with a mineral-rich footbath. Take the kit with you on vacation, a business trip, or at home, rejvenation begins with magnesium. Nourish your skin and relax your muscles, while easing tension and stiffness in tired feet. Inflate base valve first followed by both outer valves. A hand pump can be used if preferred. Place on flat surface (ideally final location) and fill with warm water. Do not exceed the “maximum fill” line. Always use carrying handles if moving bath with water. Pour entire contents of the included Ancient Minerals Magnesium Bath Flakes. Submerge feet. Relax and rejuvenate for 20 minutes. Warning: Ensure water is not too hot. Dry before deflating and storing. Keep out of reach of children.